The stimulatory effect of IL-1β is downstream of intracellular Ca2+. (A) Representative (left) and quantified (right) traces of Ca2+ currents obtained by a single depolarization from –70 to 0 mV in dispersed mouse β cells treated with vehicle or IL-1β (10 ng/ml) in the presence of either 2.8 or 16.7 mmol/l glucose (n = 27, 16, 24, 36 cells; 3 experiments). 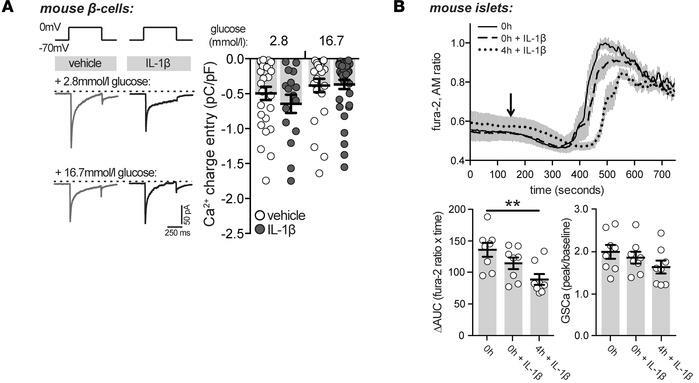 (B) Responses in intracellular Ca2+ ([Ca2+]i) from mouse islets following preincubation with IL-1β (10 ng/ml) for 4 hours (4h + IL-1β) or with acute IL-β treatment (0h + IL-1β) in conjunction with glucose stimulation (arrow; top). Change in area under the curve (ΔAUC) of [Ca2+]i responses (bottom left) (n = 8, 8, 8 islets; 3 experiments) and fold increase in glucose-stimulated [Ca2+]i (GSCa) responses (bottom right) (n = 8, 8, 8 islets; 3 experiments). n values correspond to data points from left to right, respectively. Data are mean ±SEM and were compared with (A) 2-way or (B) 1-way ANOVA followed by (A and B) Tukey post-test. *P < 0.05, **P < 0.01, as indicated.